The idea of a dog bed may seem crazy to some as the dog can normally lie on the floor or on the couch. After all, they seem comfortable, right? Wrong. Dog beds can be extremely helpful for your furry friend for a variety of reasons, some of which are medical, but all beds can be a source of comfort, safety and rest for your beloved pet. Finding the best dog beds for your pet depends on the size and needs of your animal. Is your dog aging and can no longer jump on your bed or couch for a comfortable sleep? Is your dog suffering from arthritis or a medical condition? 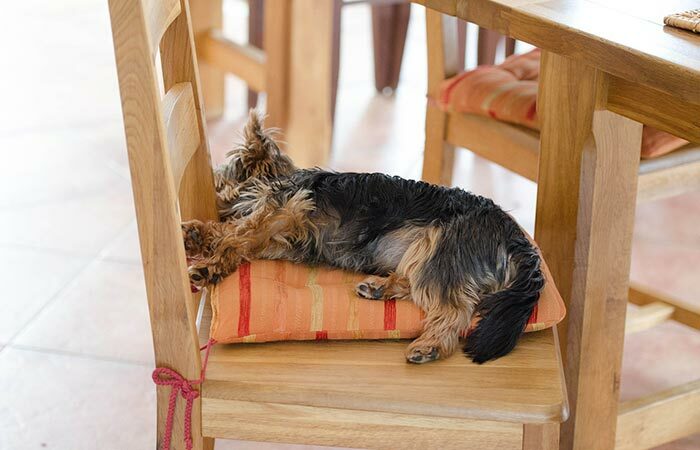 Does your dog like to have their own territory for their sleeping? Does your flooring get cold in seasonal changes? In any of these cases, a bed is the right choice for you and your dog! When you do decide to invest in a dog bed, you must first decide what type of dog bed will fit your dog’s needs and has enough space for them to be comfortable. For larger breeds, you may want to invest in a memory foam pad bed that is very thick and protects against the hard flooring. Because of the size of your dog and the fact that the bed will get much use, you can expect to replace it once the padding gets thin. However, these are comfortable beds that your dog can use easily and have space to stretch out or just curl up and fall asleep. Do you have a small dog that gets cold easily or one that has barely or no hair at all? There is a padded dog bed that comes with a cover that looks like a small bassinet that your dog can curl up in and stay warm called the Cozy Cave! If your dog likes to burrow or bury themselves in the bed, this will be perfect for your home! Does your dog have a lot of fur or long hair and happens to get warm easily? You can purchase a short dog cot for him that has no padded and is held up by four short legs and looks like a mini Army cot. The material allows for your dog to stay cool yet get in a great nap before playing Frisbee! This type of bed has a mesh material that is helpful for dogs who have accidents and can’t get outside quick enough. Lastly, if you have a dog that has an odor, or if you do not want your home smelling like a dog, you can purchase a cedar filled bed, that kills odors! They are not as padded as other dog beds and if your dog is allergic to cedar, they should not use it. However, this bed is perfect for dogs who like to hide their scent. These are also called waterproof beds and can be purchased from Brinkmann. Why should my dog have a bed? Various reasons exist as to why your dog should have a dog bed of its own. One reason is the protection of your home. A dog bed can help cut down on hair, drool, dirt and bacteria. They are more hygienic than sleeping on the floor and better for dogs who shed a lot. Secondly, your dog needs to have comfort, especially when napping or sleeping. 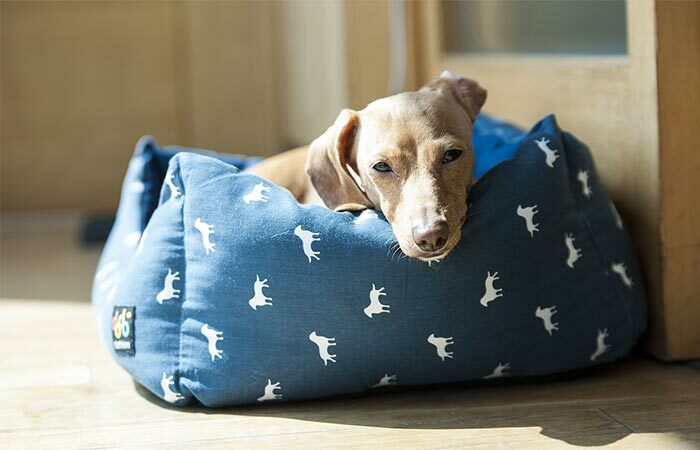 Choosing a bed that is the perfect size allows your dog to relax and nuzzle himself into. Carpeting does not help that and it’s also hard to sleep on a carpeted or wood floor. They also have a place to themselves, that they know they can go to and be happy, secure, and comfortable. Thirdly, many health issues can affect dogs, especially arthritis and dysplasia. These dogs especially need a padded bed or any dog bed that they can rest onto that will not keep their body hurting. Dog beds give support not only to their head but their limbs, spine, and back. Having a dog bed takes pressure off of your dog’s body and allows them to rest properly. Orthopedic beds are recommended for dogs with health issues. Lastly, making sure your dog has an insulated place to go to when they are cold is very important. A dog bed can provide them a warm place to rest and get away from the cold weather, as well as keep their health in good shape. When the weather is cold, many dogs like to curl up on their dog bed, and providing a blanket can keep them cozy during the winter months. Getting your dog to use the bed may be as simple as lying it next to them but it may also get more difficult. Some dogs do not want to use it because it does not have their scent or some other reason. Using training methods, like treats or commands, to make it use the bed can be helpful. Also, use something that has your dog’s scent on it to put on the bed, or even a toy. After a time, your dog will see that bed as its own. As you can see, there are many benefits and reasons as to why dogs should have their own bed, especially for comfort, health, and having their own safe place to go to for rest and relaxation. You may even see an improvement in your dog’s energy after your buy one!